While living in a basement apartment in Glassel Park in the fall of 2004, my friend Dan Klass (The Bitterest Pill) told me about this new thing called "podcasting." Dan said that I would be a perfect fit. I was a guest on Dan's show a couple of times before I finally borrowed the money to buy a computer and start my own podcast "Verge of the Fringe" in March 2005. Soon after that, I founded the groundbreaking group known as the LA Podcasters. By late 2009, I was burnt out and even thought about quitting podcasting (the term was loosing favor for the then popular "new media"). After attending a Podcamp in Arizona, I found a new perspective on podcasting. 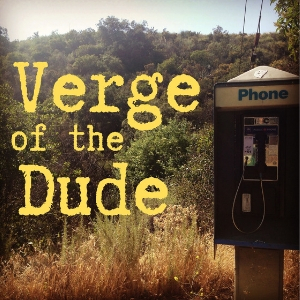 Returning to the medium in the spring of 2010 with a series of calls to my friend I called "Verge of the Dude." 2010 turned out to be my most productive year. Last spring I planned to give my podcast an overhaul, when my old server was switched to new company and then all chaos ensued. This lead to six month hiatus, until I finally had to podcast again, so I decided to back to the future and start a new podcast exclusively for my "Verge of the Dude" calls. So here we are. Thanks for listening, Dude.